You've probably heard this term before but may not know what all the fuss is about. Here's some information about trans fat that I hope will be helpful. Trans fat was a result of experiments by a German chemist. It's a man-made product that was originally advertised as healthy because it was "plant-based" instead of from animal fat. Common sense tells us that what God has made is far healthier than what man tries to do to "improve" it. Scientific evidence is finally catching up and confirming the dangers of trans fat. What harm does trans fat do? Watch out for similar dangerous substances. Definitely not. God created many healthy fats for our benefit. Some healthy fats you can eat are organic butter from raw milk, organic virgin coconut oil, virgin olive oil, avocados, raw dairy products, etc. So watch out for those dangerous trans fats. Read labels or avoid processed foods altogether. The more organic, whole, home-cooked foods you eat, the healthier you'll be. and eventually turn out lights and go to bed. As you can see, it seriously takes me two hours to "go to bed." Crazy, I know. But that how this EI life is sometimes. My friend and I were talking this week about some of the things we go through, that other people never even think about. She recently bought some shelves for her home, but she had really bad headaches from the formaldehyde they were off-gassing. She finally found some AFM sealant, and two coats later, she could tolerate having the shelves in the house. She was so excited! I laughed and rejoiced with her. I totally understand. 19 months ago we transported my mom's antique wood table from MO to here. It sat in the garage for months, all covered up (it had mildew & such on it). Then last summer she and my sister sanded it and stained it with a less-toxic stain. Then it went back in the garage. In December we finally moved it into the house. I did ok as long as the doors were open. Once we closed them, it was too much. So we covered up the table with sheets and tablecloths. Now we're gradually airing it out when we can, until eventually we'll take the covers off and use it. Such is this crazy EI life. Blessings to you today, my friends. Living with chronic health challenges isn't easy, and it can feel very isolating. It helps so much to be able to connect with others who understand. Thankfully there are several different resources that provide community. Here are just a few. Feel free to add any others you know of in the comments. Environmental Illness Resource - contains lots of health information but also forums and discussion groups. MCS Friends - a non-profit organization providing support through conference calls, newsletters, etc. Some of the members are not able to use electronics and the group provides for this as well by using phone calls and snail mail. If you know someone who cannot be online, this group might be a good support for them. There is an annual membership fee. MCS Meetup Groups - At this link you can look for a "meetup" group of people with MCS or other health challenges, people who want to get together and encourage one another. There are many health support groups on Facebook. "Christians with Environmental Illness" is one I've chosen to be part of. There's also a support group for those who have the MTHFR genetic mutation. There's a Christians with Lyme support group...and others. I hope these resources are helpful for you. And as always, please feel free to post comments here or email me with questions, thoughts, prayer requests, etc. Whatever our challenges, I know we will be stronger together. About two years ago I planted this rosebush. It has been a continual source of joy for me, but this week when it bloomed again, it was stunning! I've never seen it this spectacular, just overflowing with roses! Every time I look out our kitchen window and see it, I can't help but smile. 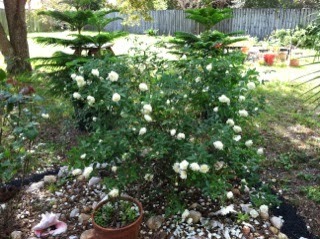 The beauty of my rosebush, just being what God made it to be, fills my heart with joy. God created such an amazing world for us! There is beauty all around us. I know how easy it can be with chronic illness, or just the stress of life, to get bogged down in our struggles. I thank God that He has provided so much beauty that can touch our souls and contribute to healing, if we'll stop and receive. We're all different, and some forms of creation or beauty speak to us in different ways. Personally, I'm touched by beautiful music. Sometimes I put on music then just close my eyes and listen. And I can feel it nourishing my body as well as my spirit. Sometimes a photo of beautiful scenery blesses me. Or the feel of a gentle breeze when I'm outside. There's an abundance of God's beautiful handiwork around us. What kinds of beauty nourish and inspire you? How often do you take time to enjoy them and receive their healing benefits? When we continually focus on problems, pain or even our "to do" list, it only perpetuates a cycle of stress. We need time away from thinking about those things. We need to experience wonder, awe, and appreciation of the blessings around us. So whether you enjoy photography, music, being outdoors, or other things, don't neglect the beauty. P.S. If you need a little help, here are some possible sources of beauty to inspire you.